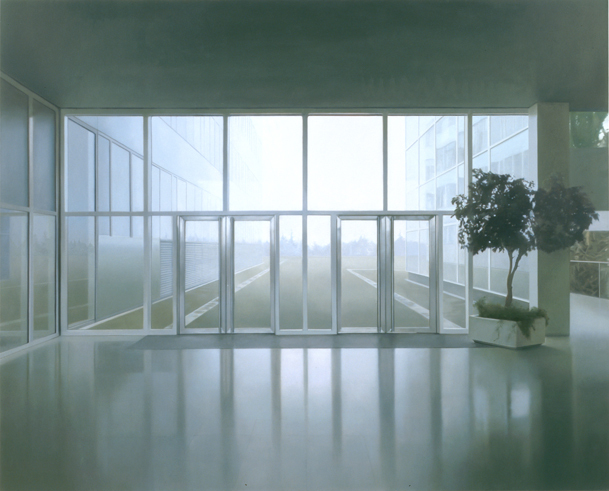 Known for his still-life paintings of architectural spaces, public spaces and landscapes Paul Winstanley constructs intricate images. 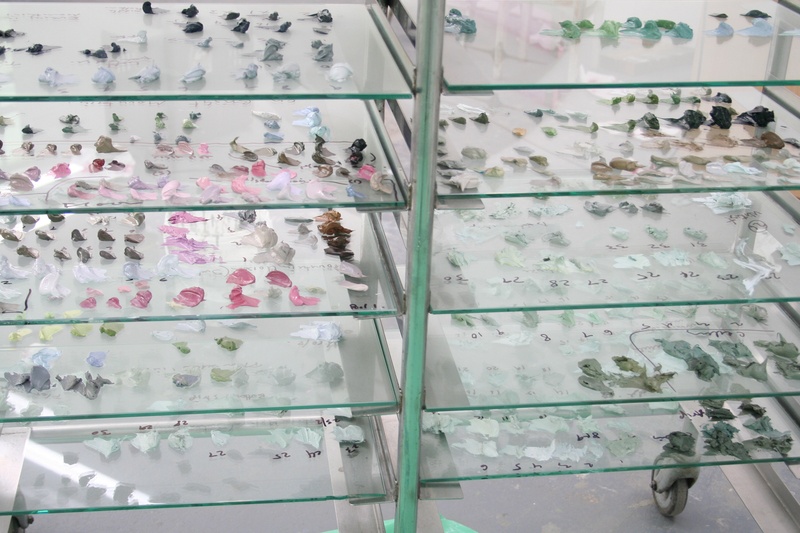 The curatorial team paid a studio visit to his atelier on February 17, 2012, in West Dulwich, London. During the studio visit the team discover and discuss Winstanley’s pull towards imagination, the countless subjectivities of historical narrative, and his recent photographic quest to document the art school crit/studio room in for his new book Art School. Winstanley contributed in Torrent No. 1 with a series of photos from his archive of 246 photographs (2011/12). 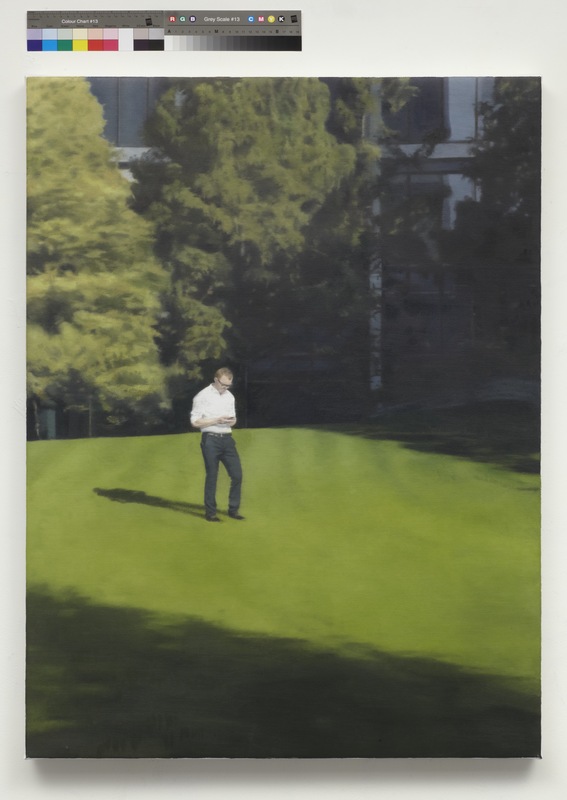 Paul Winstanley: From your point of view, from the context of the show Conflicting Tales [organized by Burger Collection in Berlin in 2009], how did the painting Utopia 2 (2005) get in dialog with the rest of the works exhibited? Daniel Kurjakovic: The point was to talk about subjectivity not as this kind of interior space of fantasies, but about how subjectivities are molded through exterior forces of history. The literal meaning of being ‘subjected’ to something. That can of course be the large scale dimension of history, but it can also be fashion or anything like that which has a collective dimension built into its mechanism. There were other pieces dialoging quite closely with your work, such as Mathilde ter Heijne’s sculpture Drawing Down the Moon (2006) and Douglas Kolk’s Suicide Girl (1996/1997). Linda Jensen: Utopia 2 which was exhibited in the show Conflicting Tales and Utopia 1, a similarly looking painting both depict a similar interior office building space. They are however slightly different; one has a tree the other is bare, one has an open corridor the other is an enclosed space. I’m curious to know which one is the real actual representation of the space, or are they both manipulated? PW: They are both the same distance from reality. Neither is a true representation of the space. There was a real space that the painting was based on. One image went in one direction and one went into another. LJ: When you were working on the second painting, did you feel more at ease because you had already painted a similar image and were familiar with the light and composition? Utopia 2, 2005, oil on linen, 190cm x 236cm, Burger Collection. PW: No, I never feel at ease. There’s always a huge anxiety when I’m painting! (Laughter) I’m never entirely sure it will work out. I’d hate it to be any other way in a sense, because it would make the whole process predictable. PW: Was there a narrative connection to Utopia and the other works being shown? DK: Yes. There were of course works that dealt with subjectivity on a more literal level than yours with historical transformation. The site we had chosen for the exhibition was close to where the Berlin Wall was originally drawn through. There was a Chinese artist in the exhibition, Zhang Dali, who was thinking about – lets call them – exterior forces working on subjects or individuals, the stringent urbanization of the city of Beijing due to the economic reforms of the 1980s. I thought Utopia would be an interesting piece in there because it would resonate differently, and pose different questions: What is this enveloping reality? How is it constructed? And how does it actually materialize? Utopia seemed to materialize these examinations, in addition to the more painterly question, which is there too. It was not meant to be an illustrative show about subjectivity, which is impossible, but to hint at different aspects. I had thought of laying out different sections in a un-didactic way. For example, one area would be more about the body and another one would be more about architectural structures. I tried to mold them as fluidly as possible. PW: The interesting thing about the social area of history is the degree to which it is incredibly subjective. It is invented and reinvented the whole time through imagination, through personal experience. I’ve talked about it in terms of my own personal experience, growing up in the post-war period for instance of the 50s and 60s and the kinds of values that pertained at that time. Particularly here [in England], with an understanding of, or even misunderstanding of Modernism that ran through the practice of art, architecture and urban renewal. And that feeds into the work. Utopia draws very heavily on that, both in the imagery and the ideas around that, and possibly the failure of those ideas as well. Or the ideological nature of those ideas in which there is always a built in notion of potential failure, as in any ideological position. As our generation changes, ideas and values that might have been commonplace in the 50s-70s are today obsolete. The younger generation has to learn what that was in terms of history. History becomes a set of values that you’re trying to espouse- it’s up for grabs; someone else might have a different narrative. The more recent the historical period, the more there is to argue about. It becomes a question of discussion. Less is pinned down to some kind of ‘received’ narrative and to that extent it is very subjective. DK: What is interesting, hearing you talk about the failure of Modernism, is also that the concept of history is often attached, strangely enough, to an interesting process whereby there is at a certain stage an ideological project of where the society will go and what its future will be, with for example retro-futurism. But then we also know that it almost never quite becomes that which is projected. PW: The past idea of the future is often very largely wrong! DK: Exactly, but it is ideology that becomes history. The future that never happened becomes the history. And there is also the volatility of that, which I think, lies in this space where it is projected ideologically into a certain direction. DK, LJ, PW walk around the studio. Situated within an industrial building, the high-ceiling quiet but resonating atelier has for neighbors a lighting company. His window faces a Victorian cemetery founded in the 19th century. Several canvases are hanging adjacently in one open large space, each at different stages of production. Next to the paintings are small photographs taped to the wall. LJ: Are these some photographs that you have taken? PW: I work from photographs and I manipulate the photographs. I usually have a fairly clear idea about what I’m trying to achieve with a particular painting or a group of paintings. And I’ll endeavor to go out and take photographs of situations that I need to find, whether it’s an institutional interior, or a situation. I take lots of them. I always regarded myself as a very poor photographer. The photographs come out slightly incorrect – they are not quite the way I imagined they should be. There’s usually a long process of manipulation, or bringing together of different photographs to make an image, and sometimes I do that within the computer. This painting is made up of three photographs to get to the situation I wanted. Other times I will work it out directly on the canvas. I’ll have different source materials. Before the 90s I did a lot more drawings and studies. DK: Yes, exactly. These drawings were never included in terms of works exhibited? PW: Occasionally, once or twice. They’re made of grids and are more working drawings. I used to show a lot of studies: small canvases that would be painted quite quickly. They worked out in balance in composition and color. They were a thought process more than anything. I am actually working on a photographic project at the moment. It’s based on the institutional idea of art school. I have, as probably many of us do, associations of art schools and institutions as places of learning and creative work. I have long thought of the interior as a completely neutral space, there is something very compelling about it. When I have visited art schools and given lectures, I’ve noticed they all have a sort of similar interior. Initially I thought of this as a project for painting. About three years ago I visited an art school in the summer when there were no students and photographed the empty studios. I realized they were much more interesting as documents. As soon as you make a painting it’s not a document. I like the purity of the idea of hard documentary photography. Last summer I went back with a proper camera and started the project afresh and its actually quite interesting! DK: Are you thinking of making a book? PW: I want to visit all the art schools in the UK, so there’s a lot! They are very minimalist images in the sense that they are made up of walls and furniture for writing, drawing etc. DK: Do you have a general range of criteria of how you want to portray the space? PW: Yes, they are all vertically oriented. Generally if there is a wall or a surface it is parallel to the picture plane. I accept what is there; I’m not introducing something foreign into the picture plane, or shifting something for compositional effects. In terms of the technicality of taking the photographs they are on a very wide aperture so that there is quite a shallow field of focus. There is a sort of commonality to all these places and yet each one is distinguished by its own particularity. The accumulative effect, if you like, is to be able to demonstrate an idea of art school, what it is and the space in which creativity occurs. DK: And it’s really stressing the insideness. PW: Yes, very much the insideness. There are three boxes of photographs so far. So there’s about 15 art schools that I’ve visited, and I have about 40 still to go to. It’s the whole country, so right up to Aberdeen in Scotland, and to Aberystwyth in Wales, through the Midlands, the Eastern counties, the West country and London. So there’s actually the journey that is an implicit part of it as well. DK: The essence of art schools! (Laughter) Only you sneak in when nobody is there. DK: Is it the first conceptual book that you are venturing into? PW: Yes, it is actually. So I’m really excited about it! It’s slightly different from the painting, but it relies on the ideas that are in the paintings. DK: It’s funny that when you look at all of them time seems to be vacuous, vaporizing. One doesn’t see any degradations, changes, architectural details that would give you hints about the time period – or students with funny hair because it’s from the 70s! (Laughter) It becomes this hovering unplaceable time/moment. It steps out of time. PW: I have often thought a lot of my interior paintings were like this. Speaking about modernism, many of those interiors have a sense of being produced or representative of that period of architectural building. Some of them do look incredibly historical now. I was talking to somebody the other day about a series of paintings I made in the 90s of TV lounges in institutions, which seemed prescient and of the moment at the time. But now, of course, these places don’t exist because no one goes to a communal room to watch television! One wouldn’t design these rooms now, so those TV rooms are already somewhat anachronistic. PW: Who knows! (Laughter) I have a terrific affection for the art school system. And not only that, I think it’s been incredibly successful in terms of producing hugely creative people who have gone on into the world not just to be artists but to be designers and all sorts of things. There’s a bit of text that I’ve produced for the book and one of the points I make is that people who go to art schools are the kind of creative individuals we will need to create the sort of industry that the world requires and needs now, whether it’s a creative or technological industry. We need the innovative creative individual. DK: It’s interesting to think about the art school not only as a practical space of organizing creativity but really what it stands for in the scheme of things today. Why do societies now have this auxiliary function of spaces where so-called artists are gathering? But in a sense I feel it’s more important to understand the ideas that motivate societies at certain stages to reflect on creativity in general. “Creativity” has also become such a difficult word right now. I’m not referring to production, nor to the industrialized serialization of creativity that politicians like very much nowadays. It’s really interesting to see if there’s a different discussion about creativity in terms of the deeper motivation to have creativity? As Hannah Arendt has said creativity is not a primary necessity like food or shelter. It’s quite fascinating to think of where creativity is really located. The images you took don’t show creativity. PW: Yes, it’s only implied. One would only think it’s about that because of the subject. The space isn’t responsible for the creativity it’s the human element that’s responsible for that, that kind of interaction. DK: Definitely the human, but also the relation to the impalpable things. What I like in the photographs is that you have these shadows and gradations. They become like boards, where one actually looks at shades of differences slowly traveling on these surfaces. The viewer in a sense hovers into the space. I think this aspect also makes them relate back to the painting in a sense. Yesterday, we were asking ourselves about these many backs that are turned to the spectator in your work. This turning away seems to show a necessity for muteness. You don’t see a face that you identify, but you see this figure that blocks half way the view and makes you actually enter in a different way into the image – a sense of a repoussoir. PW: First of all the painting must be a certain size. I’m requiring the viewer to enter into a relationship between the space in the painting and their physical person. There’s a connection between the space in the painting and the floor you are standing on which is actually very important. I see these non figurative paintings as being figurative in the sense that the viewer becomes that figure, they become the protagonist. I’ve always thought about the viewer in a very deliberative and conscious way, almost in a philosophical way. I don’t think of a particular individual looking at the painting, I think of the viewer as a perceiver with a personality and set of cultural ideas. On the other hand the figurative paintings are more pictorial so they can be much smaller – you can peer into them. The figure depicted is almost like a reflection of the viewer, but this pictorial figure is doing the work of viewing in relation to your own viewing. And the viewer, as you say, is partly obscured by that. This different kind of relationship gives me as a painter a lot more freedom in some ways, to explore other kinds of relationships, between objects, or paintings as objects. A painting doesn’t have to be three meters by two. It can be a much more intimate object. DK: That’s interesting! Because there’s a proportion within the image that’s clearly established. One more thought about these “standers”: one doesn’t have a sense that viewing actually is prescribed. What is viewing? Is it the way we register surrounding space or is viewing more of a constant back and forth in terms of what you see through time? Or is viewing something that almost disappears, not through the visual stimulus from the outside, but the interior veils of your own concerns and backgrounds that slice your eye here and there a little bit. 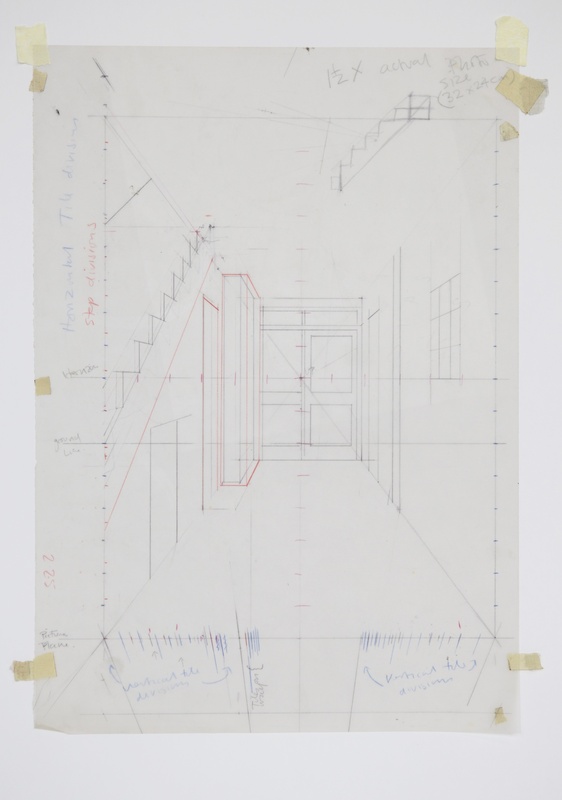 It’s this idea of the membrane, that the viewer is mediating the inside and the outside. PW: That’s very much a part of the work. There’s been a large series called Veil, which I started in about 1998 and finished last year. That’s very much about the idea of finding out what is possible to see, what it’s possible to be aware of, the sheer subjectivity of that. How one’s vision and perception is so determined by the condition in which you are perceiving and viewing. There’s no such thing as a neutral idea of that. Those paintings deal in a very perceptual way with how you might imagine what you’re seeing. 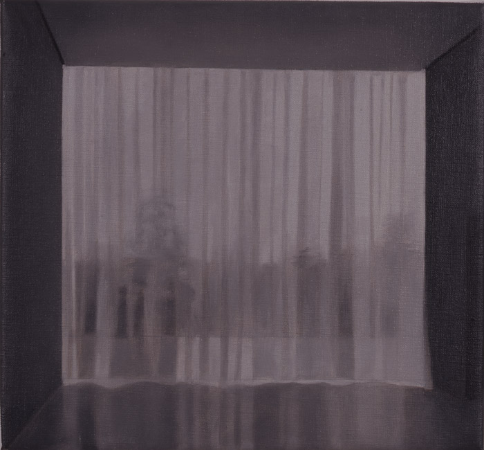 In many of them there’s a landscape behind the semi-transparent curtain. But when I paint it, I really don’t paint very much there. There’s almost nothing. I’m just implying it. But the mind is fantastic! You stand there and after a little while you start to see that hill and that lake, and those trees and that light coming through. For instance in certain interiors there might be a complex composition with tiles and wooden block floors and the light comes and fractures the surface and you see scratches and shadows. I’m working from photographs, and the photographs have infinite amounts of information. I mean you could spend six months painting a floor but I might only spend three days because I’m not really interested in that degree of photorealism. I’m interested in how little information I need to put into the painting and still allow the viewer to see everything that’s there, allow their mind to do a lot of the work. I like to play with this idea. How much you as an individual looking at a piece of work, how much you contribute to the painting so the painting doesn’t do all the work for you. I want you to do a lot of the work, and not even be conscious of doing it. So it becomes kind of interactive, and that’s important for me. When I see painters trying to get something literally correct, whatever that means, it just dies, it doesn’t have any life because the life comes from the viewer. DK: A couple of weeks ago I just went to see the Richter exhibition. I am curious, did you ever do what in his case was termed abstract painting? PW: I started my career as an abstract painter. As an art student, and this was the mid 1970s, I was essentially very influenced by American minimalist painting. So I was making big canvases, with one color. Basically without realizing it I was learning the nuts and bolts of painting about scale and about color. It wasn’t just an educational process, there was a belief in what I was doing, it was seriously considered stuff! (Laughter) As that period developed, I was 19 or 20, the paintings became more complex, but they remained within this idea of abstraction. They maintained a belief in the phenomenon of the thingness of the thing. The thingness of the brush mark and the thingness of the surface. There came a point in the early 80s where it was like losing faith in a religion, I lost faith in it. In retrospect, I would not have been able to articulate this at the time, but I think I had a problem with the fact that with abstract work the painting can never exist within its own critical framework, it needs a textual context or a known historical context. For instance when we look at Malevich’s Black Square, it has this incredible power because it’s Malevich’s Black Square painted during the Russian Revolution. All that content is part of it. But if I painted an exact reproduction of his Black Square it would mean something completely different or nothing at all. And I found that frustrating. I wanted to find something, that somehow embedded within contained a notion of its own critical stance. It’s like an impossible thing! So I was in the wilderness for a couple years until the mid 80s when I began to realize the potential of some new ideas, which turned into the work you’re familiar with. But to begin with the idea of a holistic surface survived from these earlier paintings. So for example Utopia and other paintings have this totally undifferentiated surface. You don’t see the process of it being made. It’s almost as though the surface and the image have separate existences. DK: Yesterday we were talking about the ways that you have chosen to discuss/treat these differentiations between surface, picture and image. I was in the National Gallery and I was looking at the Jan van Eyck, not the famous The Arnolfini Portrait, but the one on the left, which is a portrait. As you probably know there’s a frame which is an important part of the painting. Basically we started to talk about where in your work this discussion of “What are we looking at?” lies in terms of the format, the idea of the picture as screen and as you put it the thingness of the thing. It seemed that a lot of it was done in a mis-en-abyme style in the sense that you had almost narrative pointers in the painting, but now as you talk I realize much more this kind of thingness. I asked Linda, “Why do you think he never went beyond the actual chassis?” as many would have done with historical examples where the painter flips over and actually starts to allow for a parasitic movement outside of it. But it makes sense now hearing about this experience with literalism as we know it from minimalist practices, of Barnett Newman and late Abstract Expressionism. PW: It forms everything that I have been doing the last 20 years. It’s a shame I don’t have paintings from 1975, they didn’t survive. DK: This device (Pointing to paint chariot) looks like it was used in a different context before. It looks fantastic! PW: It’s purely for practical reasons. There’s a great deal complexity with the tones. Basically it’s a storage of color mixes, a palette to store the colors as samples. PW: Yes, it is. Depending on the painting, the differences can be subtle, but they are crucial, and it would be very difficult to do it from scratch without having a sample. DK: You develop the colors yourself? 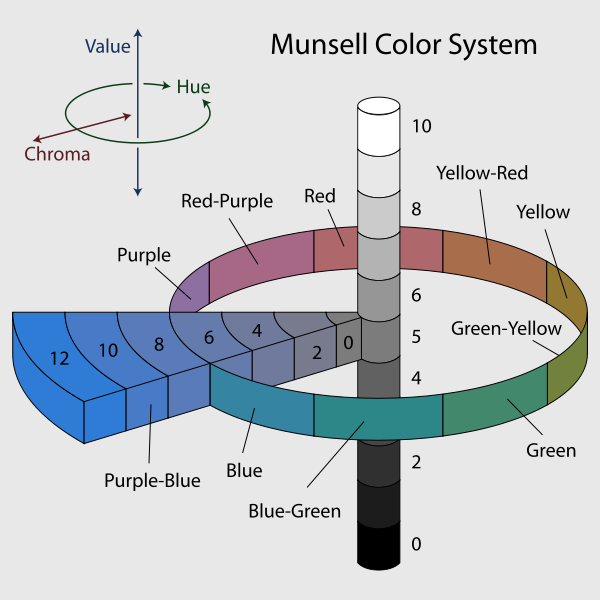 Munsell color system. From Wikipedia, the free encyclopedia. PW: Yes, I don’t use tertiary pigments, like Umber or Sienna. I have a range of colors which is prescribed with a complete color circle, and black and white. And with that you can make any color! If you have, say, Burnt Umber or Raw Umber, it’s a very localized place in the color universe. Over time you can construct any color in the color universe. Color is a three dimensional structure. It’s very complicated when you first start thinking about it. I have a kind of mental register of colors. DK: In the process of learning about color-making, which is an art in itself, did you revisit some of the models of how to think about color, and the interrelationships between colors? PW: Yes, in modern times since the 15th century, the idea of color has changed enormously according to what pigments were available. In the last 100 years it’s exploded because pigments have changed incredibly. Turner’s watercolors are a great example, because he would have a very narrow range of pigments and, like I was talking about before, about the mind doing the work, he created a sort of implied color. He doesn’t paint the color that you think you’re seeing which is interesting. Whereas my use of color is not a pigment based color in that sense it’s based more on a scientific value of color. There’s a color theory called Munsell’s Color Theory that reflects my own thinking, it’s a 20th century idea.